Facebook is coming! So are the other tech giants, as well as an uncountable number of vertical competitors. To survive as an online marketplace, the only strategy is to offer something no one else has and to keep coming up with smart ways to differentiate your online marketplace from the rest. There are multiple approaches to make your marketplace stand out and the truth is that you may have to deploy more than one of these to truly set your platform apart. Because you are not alone in wanting to build a unique marketplace experience. In fact, according to Gartner “By 2018, more than 50% of organizations will redirect their investments to customer experience innovations“. Designing your user journey with engagement in mind is one of the strategies that can help you win the race. After all, engaged users are more likely to remember your brand, and engaged consumers buy 90% more frequently and spend 60% more per transaction. At Besedo we know how important high-quality content is to user engagement, however, we also know that you need to apply an array of other tools to create a truly engaging user journey. 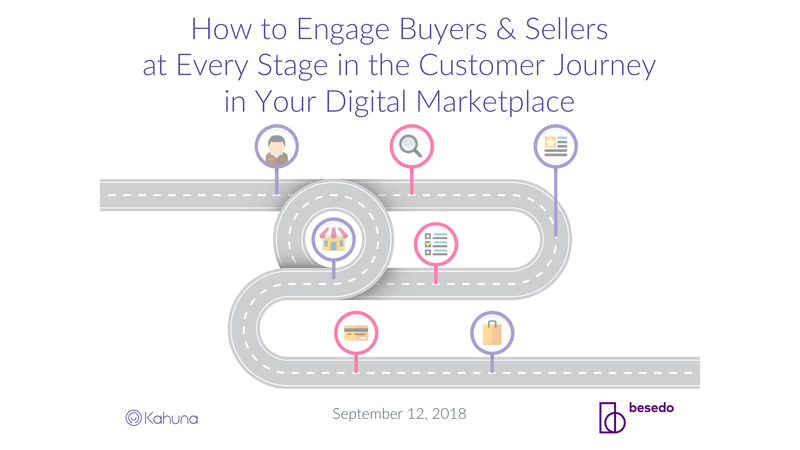 To cover more ground, we partnered up with Kahuna, who specializes in data-driven personalization, and did a webinar to provide a broad perspective on engagement driven user journeys for both buyers and sellers. The key to getting it right is to think engagement into each touch point the customer has with your business. Learn more from Kahuna’s Jeff Nolan and Besedo’s Sigrid Zeuthen.